The popular aft-cabin motor yacht with full-beam salon—focal point of the entire boat—with nearly seven feet of headroom. Wing doors and hardtop lead to molded stairway down to the large extended swim platform.Generous space on the bridge for family and friends featuring a centerline helm, wraparound seating and wet bar. United Yacht Sales New Jersey would love to guide you through a personal showing of this 39' Carver 396 Motor Yacht 2001. 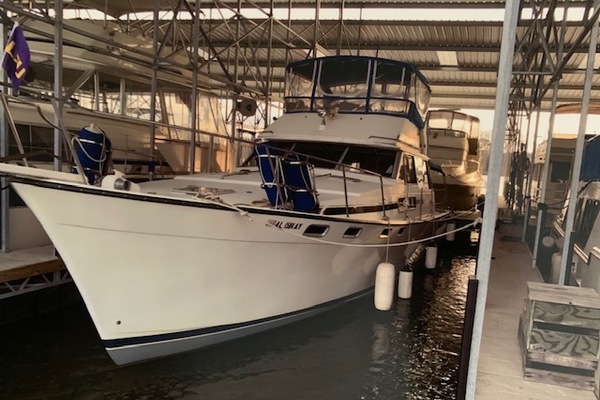 This yacht for sale is located in Houston, Texas and priced at $113,000. For a showing please contact us by filling out the form on this page and we will get back to you shortly! Manufacturer Provided DescriptionIntroduced in the 2000 model year, the 396 Motor Yacht was an overnight success. This aft cabin motor yacht has the aggressive styling of an express cruiser. As well, the 396 has changed the rules concerning aft cabin styling. The unique raised walkdeck design has allowed design changes that give the 396 a wider cabin - much roomier than one would expect. Adding to its appeal, the cabin living space has been combined into a spacious, open "great room" with plenty of salon seating and space for all sorts of extra amenities, like an end table, TV and VCR. Two luxurious staterooms and two head compartments provide welcome privacy, with the forward head compartment providing separate head and shower compartments.AccommodationsSALON- 110V outlets (3) - GFCI protected. AC and DC distribution panels. Cabin stairway - integral, with cherry wood hand rail. Carpet - beige, tufted cut pile, 65 oz., crush-resistant, 100% nylon. Designer decor. Endtables (2) - integral, solid surface top, at either end of lounge. Entertainment group - TV and VCR, with wiring for 2 speakers each in salon, master stateroom, and aft deck hardtop. Entrance door - acrylic, curved, sliding, handle lock, with interior screen. Floor access hatches - engine room and amidships bilge. Fresh air system - passive, with controllable overhead vents. Hardware highlights - brass/chrome. Lights (9) - halogen, overhead, recessed. Lounge - Flexsteel, chamois UltraLeather, with double incliners, 70" corner extension and 36" end. Miniblinds - decor-matched. Rocker light switches. Sofa - chamois UltraLeather, storage beneath. Solid surface countertops. Stereo speakers (2). Storage cabinets (2) - in aft bulkhead. Table - free-standing, elevating top. Telephone connector. Window vents (2).MASTER STATEROOM- 110V outlets (3) - GFCI protected. Bedside endtables - solid surface top, storage beneath. Berth - queen, inner-spring mattress, offset island. Carpet - beige, tufted cut pile, 65 oz., crush-resistant, 100% nylon. DC distribution panel - 12V safety systems. Designer decor. Entrance door - secures closed, integral doorstop, stainless steel hardware. Hanging locker - cedar-lined, carpeted, 16" hanging bar, shelf, automatic light. Hanging locker - 17" hanging bar. Hardware highlights - brass/chrome. Lights (2) - halogen, reading, recessed. Lights (3) - halogen, overhead, recessed. Miniblinds - decor-matched. Portlights (2) - screened. Rocker light switches. Stereo speakers (2). Storage cabinets (7). Storage drawers (5). Telephone connector. Window - removable, tinted, in aft bulkhead.Master Head110V outlet - GFCI protected. Entrance door - secures closed, integral doorstop, stainless steel hardware. Hardware highlights - brass/chrome. Head fan. Lights (2) - halogen, overhead, recessed. Medicine cabinet - mirrored, 2 shelves. Portlights (2) - screened, privacy glass. Rocker light switches. Soap dish - wall-mounted, solid glass, brass/chrome highlights. Toilet - electric flush, pedestal. Toilet paper holder - mounted in vanity cabinet. Towel ring. Vanity - solid surface top and backsplash, undermounted stainless steel sink, drawer below, cabinet below with door. SHOWER STALL - Entrance door - secures closed, acrylic in aluminum frame. Integral bench seat. Light - halogen, overhead, recessed. Shower head - adjustable height, detachable for use as handshower. Towel bar - 14".Guest Stateroom110V outlets (2) - GFCI protected. Bedside endtables - solid surface top. Berth - queen, island. Carpet - beige, tufted cut pile, 65 oz., crush-resistant, 100% nylon. Designer curtains - decor-matched. Designer decor. Entrance door - pocket-style, secures open and closed, stainless steel hardware. Hanging locker - cedar-lined, two 8.5" hanging bars, automatic light, integral door stop. Hardware highlights - brass/chrome. Lights (5) - halogen, overhead, recessed. Mirrored headboard. Overhead hatch - circular, 20.5" diameter, lockable, inside screen, over berth. Portlights (2) - screened. Rocker light switches. Step-ups next to berth - carpeted. Storage - beneath berth. Storage cabinets (4). Telephone connector.Guest Head110V outlet - GFCI protected. Clothes hook on entrance door. Entrance door - secures closed, integral doorstop, stainless steel hardware. Hardware highlights - brass/chrome. Head fan. Lights (2) - halogen, overhead, recessed. Medicine cabinets (3) - mirrored, 2 shelves. Portlight - screened, privacy glass. Rocker light switch. Toilet - electric flush, pedestal. Toilet paper holder. Towel ring. Vanity - solid surface top and backsplash, undermounted stainless steel sink, drawer below, 2 shelves below with door. SHOWER STALL - Designer shower curtain - decor-matched. Entrance door - secures closed, stainless steel hardware, integral doorstop. Grab rail - 29.5" stainless steel. Integral bench seat. Light - halogen, overhead, recessed. Portlight - screened, privacy glass. Shower accessories cabinet - 2 mirrored doors. Shower head - adjustable height, detachable for use as handshower.Galley110V outlet - GFCI protected. Coffee maker. Designer decor. Flooring - wood plank. Hardware highlights - brass/chrome. Lights (2) - halogen, overhead, recessed. Microwave/convection oven - built-in. Range - electric, three-burner, ceran top. Refrigerator/freezer (upright). Rocker light switches. Sink - stainless steel, with solid surface cover. Solid surface countertops. Storage - under sink. Storage drawers. Storage cabinets.DecksAFT DECK - 73 ft2 (approx. ), integral to deck, self-draining. Cleats (2) - 10" stainless steel, through-bolted through aluminum backing plate, inboard-mounted with stainless steel hawse pipes. Command bridge stairway - integral to deck with stainless steel hand rail. Electronics arch - custom aluminum with acrylic polyurethane surface coating and UV protection. Electronics arch access plates (5) - corrosion-resistant polymer attached with noncorroding screws and waterproof sealant. Grab rail - 25" stainless steel, across lockers. Hand rail - 1.0" OD, stainless steel, around entire aft deck. Hardtop over entire aft deck. Lights (4) - courtesy, recessed, with exterior-mounted switch. Lights (2) - overhead, recessed, with exterior-mounted switch. Lockers (2) - upper and lower, double doors, interior stainless steel restraining rail. Stereo speakers (2). Transom door - aluminum, stainless steel hardware, with 22" grab rail across top . Wing doors (2) - secure open and closed, acrylic in aluminum frame, stainless steel hardware, provide access to the side decks. SIDE DECKS - Bow rail - 1.0" O.D., lineal-buffed, welded stainless steel, with additional intermediate rail amidships and forward. Bow rail stanchions - double-welded (inside and outside), stainless steel, anchored to aluminum backing plates laminated into deck. Cleats (4) - 10" spring, stainless steel, through-bolted through aluminum backing plate. Deck toe rail. Grab rail - stainless steel, over cabin windows, running length of cabin and above windshields. Rub rail molding - heavy-duty, stainless steel insert. FORE DECK - Cleats (2) - 10" stainless steel, through-bolted through aluminum backing plate. Cleat - 10" stainless steel for anchor line, through-bolted through aluminum backing plate. Locker - in-deck, self-draining, for fender storage and anchor chain. Over-the-stem anchor roller.MechanicalAnodes - zinc, sacrificial. Battery master disconnect switches. Battery restraint brackets. Bilge blowers (12V). Bilge pumps (3) - 1500 gph each, automatic/manual operation. Brass valves for all underwater thru-hulls. CO detectors in salon and staterooms. Compass - illuminated. Engine alarms - temperature and oil pressure. Fire suppression system - automatic, FE241 (FM200 in European Community). Galvanic isolator/zinc saver. Horn - air/electric (12V), trumpet. Internal bonding system. Molded nonskid surfaces on all walk decks - diamond pattern. Navigation lights (COLREGS).ElectricalAC/DC distribution panels with magnetic circuit breakers and integral bilge blower controls; AC voltmeter; AC ammeter. Batteries (4) - deep cycle, marine (12V). Battery chargers (2) - electronic, AC-DC converters. External connectors - CATV, telephone. Ground Fault Circuit Interrupt (GFCI) protection - all 110V outlets. Shore power connector - 50 amp. Shore power cord - 50 ft. Wiring system - tinned copper strand wire, harnessed, color-coded, labeled, meets or exceeds ABYC standards.ConstructionSolid fiberglass hull bottoms with Knytex substrates and Vinylester barrier coat. Hand-laid, molded fiberglass components featuring composite laminate hullsides, decks, and cabintops. Molded fiberglass stringer system. Structural engine mountings - reinforced stringer mountings with gusseted, angle steel plates. Fabricated aluminum floor frames with stainless steel stanchions. Cherry wood bulkheads, cabinetry, and trim throughout cabin, with high gloss finish. Tinted, tempered safety glass frameless window systems. Unitized deck and cabintop construction with integral aluminum truss reinforcement in cabintop structure.